Adding industrial chic into your contemporary home or apartment is easy when choosing the Urban 2 Drawer Bedside. The cube is finished with a rustic wood-effect, that ensures the design of the bedside table is truly industrial alongside the metal frame. Modern bedrooms will benefit from the addition of the Urban 2 Drawer Bedside Rustic. The two drawers offer plenty of storage space for those bedside essential items. The surface of the Urban 2 Drawer Bedside is large enough to house a bedside lamp, clock, mobile phone and a number of other bedside items comfortably. So you never have to do without them! The addition of the two drawers expands on the storage space available. It's the perfect bedside table for smaller bedrooms or those who have an abundance of belongings that can't find a space to live. The Urban 2 Drawer Bedside is practical and stylish. Generous drawer sizes ensure there's enough space to neatly store your belongings away, out of sight, but in easy reach! The table fits perfectly alongside the bed, providing excellent storage options to help keep the bedroom organised and free from clutter. The Urban 2 Drawer Bedside creates a contemporary space by combining the metal frame and wood-effect finish of the drawers. The result is a smart piece of bedroom furniture. 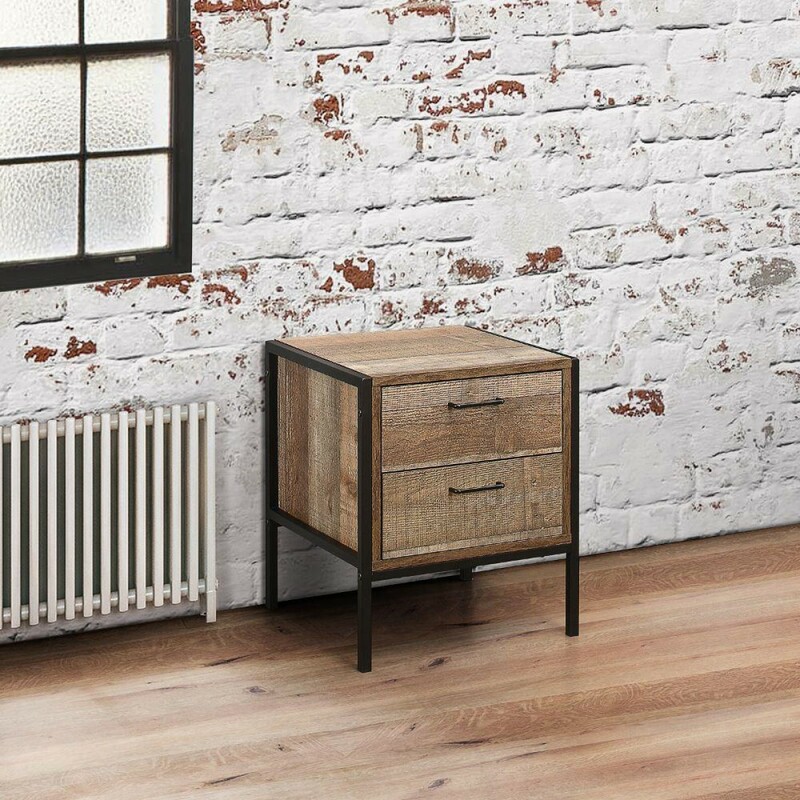 The industrial Urban 2 Drawer Bedside is perfect for modern homes. The 2 drawers and contemporary style are the ideal solution for modern homes that need some extra storage options, without spoiling the theme or vibe of the interior. It's compact, yet spacious, offering plenty of space for gadgets, books and even clothing. Keep the Urban 2 Drawer Bedside in perfect condition by wiping down with a dry, soft cloth. The product is part of the Urban Wooden Bedroom Furniture Collection.